Presentations, in many different formats, are a big part of being a small business owner. You may be delivering your elevator pitch at a networking event, pitching your services during a sales call, or speaking at a small business conference. Although they are all very different types of presentations, they are all important for small business owners. If you are using your valuable time to prepare and deliver some sort of presentation, you want it to be a success. You want to engage your audience and make your presentation memorable (for the right reasons!). Here are some tips to help you deliver a winning and memorable presentation that you actually enjoy giving. Regardless of the type of presentation, don't wait until the last minute to start preparing. 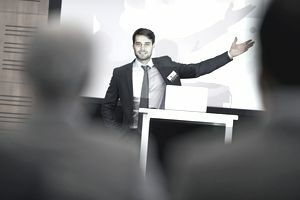 As soon as you know you will be presenting or attending a meeting that requires more informal presenting, start thinking about the content of your presentation. Your audience should drive not only the content you present, but your approach as well. Find out who will be in the audience and tailor your presentation directly to them. What are your goals? Why are you presenting? Are you trying to win business? Are you sharing your expertise? Take time to identify your goals and keep them in mind as you develop your presentation. Make sure you know how long you will have to present. It's vital to know if you're delivering a 60-second elevator pitch, a half hour tutorial or a two-hour presentation before you start preparing your content. Even if your presentation is short and simple, avoid the temptation to keep your content only in your head. Your presentation should be written down so you can revise, practice and fine-tune before the big day. Depending on the type of presentation, you may want some kind of visual aid to add to your presentation. However, do not include every piece of content on your slides. Keep it short and simple. Your visual aid should be for your audience, to drive home important points, not a crutch for your presentation. Don't worry, I'm not going to suggest that you need to memorize every word of your presentation. But...start by memorizing the key points anyway. Knowing the content inside and out will make you more comfortable and confident during the delivery. Run through your presentation in full several times before the big day. You may even consider video taping yourself so you can self-critique and fine-tune. Not only do you want to be on time, but if you get there early, you can scope out the room where you will be presenting and start to familiarize yourself with the environment. You can also meet some of the people in the audience, which can help add a conversational tone. Hopefully you're passionate about the subject matter. Let your enthusiasm come through in your delivery. It can be contagious and the perfect way to engage your audience. To prevent boredom for your audience, plan group activities, ask questions and work in a break, if appropriate. Humor can be powerful in a presentation setting. Not only can it put the audience at ease, but it can make you more relaxed as well. Handouts are a great way to drive home your message and give attendees something to refer to after they leave. Be sure to include your contact information and invite the audience to contact you with questions. And always attend events with a handful of business cards. Presentations can be nerve-wracking if you don't deliver them often. But don't be intimidated by the process. Follow the tips here to deliver a winning proposal with confidence next time you need to get in front of an audience.